It seems perfectly natural to expect that two motorists who depart from the same location and follow the same directions will end up at the same destination. But according to a Johns Hopkins University mathematical physicist, this is not true when the “directions” are provided by a turbulent fluid flow, such as you find in a churning river or stream. Verifying earlier theoretical predictions, Gregory Eyink’s computer experiments reveal that, in principle, two identical small beads dropped into the same turbulent flow at precisely the same starting location will end up in different – and entirely random – destinations. To conduct his study, Eyink used a virtual “stream” that is part of an online public database of turbulent flow created with Whiting School colleagues Charles Meneveau and Randal Burns, as well as with physicist Alexander Szalay of the Krieger School of Arts and Sciences. Into this “stream” Eyink tossed virtual “particles” at precisely the same point and let them drift within the fluid. The researcher then randomly “kicked” each of the particles as they moved along, with different “kicks” at different points along the way. The particles, as one would expect when subjected to different “kicks,” followed different paths. This phenomenon is called “spontaneous stochasticity,” which basically means that objects placed in a turbulent flow – even objects that are identical and which are dropped into the same spot – will end up in different places. “Thus, we know that ‘God plays dice’ not only with subatomic particles, but also with everyday particles like soot or dust carried by a turbulent fluid,” Eyink said. Eyink’s study also revealed that the magnetic lines of force that are carried along in a moving magnetized fluid (like a stream of molten metal) move in a completely random way when the fluid flow is turbulent. This contradicts the fundamental principle of “magnetic flux-freezing” formulated by Nobel Prize-winning astrophysicist Hannes Alfvéen in 1942, which states that magnetic lines of force are carried along in a moving fluid like strands of thread cast into a flow. 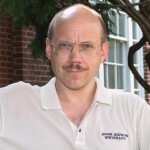 “This principle of Alfveen’s is fundamental to our understanding of how fluid motions in the Earth’s core and in the sun generate those bodies’ magnetic fields, and my study may provide a solution to the longstanding puzzle of why flux freezing seems to fail in violent solar flares and in other turbulent plasma flows,” Eyink said. This study was supported by the National Science Foundation.